September 2019 – Professionalism & excellence for the future. Our ever-changing world, which has become smaller through new advanced methods of communication, is demanding changes to how we live our lives and how we work, how we learn, how we share new information, and how we comply with new laws, regulations, and demands of the changes in global trade. 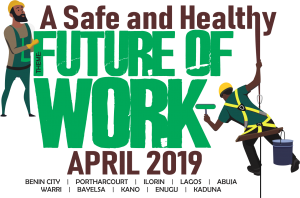 April 2019 – World Day for Safety and Health at Work 2019: Future of Work. On April 28 annually, the World Safety Organization (WSO), Nigeria observes the annual International Labor Organization’s (ILO) “World Day for Safety and Health at Work”. Several locations within the country are currently being planned to host this year’s event; Benin, Lagos, Abuja, Warri, Portharcourt, Bayelsa, Ilorin, Enugu, Kaduna, and Kano. October 2019 -WSO-NG NatConf & Awards. WSO Nigeria is proud to host another edition of her National Conference and Awards on Health, Safety, Security, and Environment, at the Loveworld Convocation Arena Annex, 21 Billings Way, Oregun, Ikeja, Lagos, Nigeria from 29-31 October, 2019. This year’s theme, “Visualize, Realize and Internalize: The Culture of Safety” will provide an unprecedented opportunity for HSSE Professionals, academic scholars and concerned public of all stripes to share their research and experience with colleagues along with discuss and debate on the latest standards and advances in the field.WSO Nigeria is proud to host another edition of her National Conference and Awards on Health, Safety, Security, and Environment, at the Loveworld Convocation Arena Annex, 21 Billings Way, Oregun, Ikeja, Lagos, Nigeria from 29-31 October, 2019. This year’s theme, “Visualize, Realize and Internalize: The Culture of Safety” will provide an unprecedented opportunity for HSSE Professionals, academic scholars and concerned public of all stripes to share their research and experience with colleagues along with discuss and debate on the latest standards and advances in the field.